All of my books fall within the paranormal genre, but the settings are much different. One is set in modern Hawaii, one is set in World War II, and Near The Wild is set in 1880 Kansas. Near The Wild came to me while writing it, as all my titles do. This novel is about a young woman coming of age, while just beyond her reach or awareness lies a wild magic that follows her. Characters in the novel walk a line between lawlessness and civility, as many did in the Old West. They are pioneers trying to make a society out in the middle of the wilderness, pretending all is as it should be, when just beyond the town is a savage land and people. 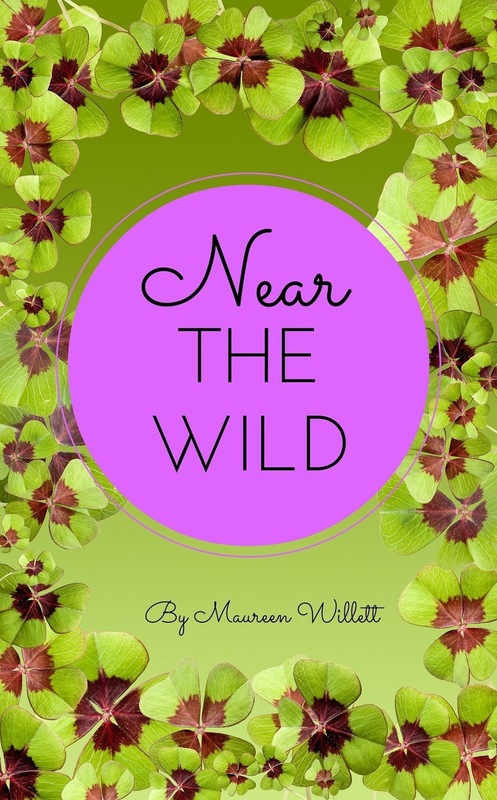 Near The Wild, though, also refers to the men in her life and how far she’ll go to keep them. Titles reveal themselves to me while I’m writing the piece, just as all my characters do. I never quite know what the end will look like when I start writing a novel, so I don’t title my books until it’s time. Very much based on a combination of my mother’s and father’s ancestors and their experiences immigrating to America. Even the sod house where the MacKeighrys live in Kansas is based on a house my grandfather grew up in. I had the fortune to see it many years ago while visiting my Dad’s family farm before it was destroyed. Some of the characters are fantasy, such as the fae who follows the family from Ireland to Kansas. Oddly, the MacKeighry’s practice of making tables, or objects, rise off the ground is based in fact. We did it as kids with my aunts quite often at family holiday gatherings. It was a fun family game we all played together. Only as an adult did I realize it was unusual. I’m working on my next novel, The Edge, which is about a woman in modern Los Angeles who can see people’s past lives just by touching them. It’s a story about redemption. She damned her soul in her last life, which ironically she can’t completely see because what she did was too abhorrent to be remembered. Now, she’s trying to save herself by helping the man she wronged in the previous life. After my bath and hours of lying in bed with the covers pulled over my head, I put on my favorite pair of worn blue jeans and a T-shirt. My bare feet made a squeaking sound on the hardwood floors as I walked the length of the hallway to the kitchen. I threw away my unfinished vanilla latte and then took my time pouring a glass of Montelena chardonnay, enjoying the anticipation of tasting the clear, golden treasure. I’d missed drinking one poison so had to replace it with another. It was an unseasonably balmy Southern California night, so the thought of going up to the studio and possibly painting seemed appealing. I would throw open the lead-lined cathedral windows and let some of that Los Angeles smog in to inspire my artistic nature, I thought with a smile as I climbed the back staircase. I rented the attic of the building to use as a studio, so I was the only one with a key. It was basically a large, empty room with a cement floor, naked brick walls, and floor to ceiling windows that had a somewhat gothic design to them. It was a dark shadowy place at night, but during the day, the natural light from the tall windows complemented my abstract meanderings around the canvas. I entered the room, pulled the string to the lamp by my easel, and set down my glass. I froze, unable to turn, feeling his presence. “You know that’s not up to me,” he answered with a bit of sadness. “Of course.” He took a step toward me. He reached out and lightly put his fingers on my hair. I held my breath and looked up into his eyes. I longed to run my fingers through his intoxicating blond waves, but I didn’t dare. That familiarity had not been my privilege for quite some time. The sensation of his hand on my head sent sparks through my veins. I closed my eyes. His fingers moved to my cheek, and I sighed. My knees became weak to the point I was afraid I’d fall at his feet. I’d let him do whatever he wanted. I hoped he wouldn’t stop. It was a curse for both of us, and probably the reason he’d stayed away so long. He stepped back and took his hand away. “You’ve met him, haven’t you?” He toyed with the paintbrush on my color palette, keeping his eyes averted. I didn’t answer at first. “Yes,” I said after a moment. “And so it begins,” he said, glancing over at me. Time. The time needed to do my stories and characters justice is a challenge. I also have my own business, so my day job keeps me quite busy. I get resentful when I don’t have enough time in the day, or week, to write. Just sit at your computer, or paper and pad, and write, as much and whenever you can. Every successful author says it, but it’s really true. If you don’t write, you can’t be a writer. Cowboys and leprechauns both occupy Maeve MacKeighry's world in 1870, and she must decide which will win her heart. Leprechauns are feared, even in Ireland, but that doesn't prevent Maeve from striking up a friendship with one who lives near her village. But once Maeve becomes a young woman, the local villagers start to gossip, especially since the MacKeighrys are known to practice magic in their home. It's just for entertainment, but the town folk don't see it that way. Rather than be outcasts, the MacKeighrys set off to America to homestead in Kansas, vowing to leave their magical ways and friends behind. Little do they know that Maeve's friend follows and protects them on their journey. Most of the novel takes place in Kansas in 1870 and is based on the author’s family history. The idea of the MacKeighry’s sod house came from the home of Willett’s great grandfather. She was lucky enough to visit it as a teenager before the house was destroyed. One of the characters, Nikki Fuerst, is based on an ancestor, a prince from Austria who was disinherited for marrying a commoner and sent off to America. 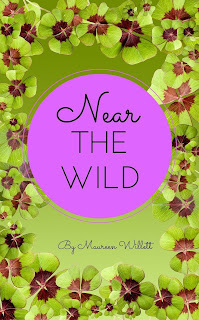 Stories Willett has been told her entire life about her family’s history and traditions, such as levitating tables, are included in Near The Wild. When I awoke, I felt much more alert. The room was alight with sunshine streaming through the windows, and my body felt restless and stiff. I tried to sit up, but strong arms prevented it. I looked up into passionate eyes and thick lashes. He laughed. “Your usual obstinate temperament seems to be returning, so perhaps you are on the mend.” He sat down on the bed next to me, which made him much too close for my comfort. I raised my eyebrows at him, wondering when we had become so familiar, but then I had to look toward the window. It was too alarming to look at his face this close, especially his luscious mouth, which was curved into a much-too-enticing smile. He gracefully stood and leaned against one of the bed posts, probably sensing my discomfort. This proved to be even more devastating to the hatred of him I tried to cling to in my heart. To see his tall, lean but broad-shouldered frame decorated in such fine silk and linen was a sight to behold. Even without a proper cloth tied around his neck or a jacket, he devastated. And then he had the audacity to push his shirt sleeves up around his elbows, revealing muscular arms and flawless skin. He ran one hand through his thick, black hair and then let it rest against his lips. Lucky hand! All I could think about was the feel of those lips. Where had my coveted hatred gone? “Are there others?” he asked with a surprised look. “Well, no! There’s no one, really.” I couldn’t help but be a little flustered. “Ahh, the boy is the one you care about. Or is it Finn?” His voice was now insistent, and his eyes darkened. Unfortunately, his fingers were still pressed to his generous lower lip, distracting me from any rational thought. My eyes had a will of their own, focusing on where his fingers touched. Then, I looked into his eyes, knowing I’d been caught staring at him with desire. The smile that came to his face assured me of it, so I diverted my eyes, while my cheeks grew hot. “I’m waiting for an answer,” he said in a quiet yet commanding tone. How anyone could resist it, I couldn’t figure. His dark brows went together in curiosity, and he tilted his head a little. I took another deep breath, not meeting his eyes. “Not everyone can see him, so I doubt that you have. Finn can appear to be about any age he wants, but actually time doesn’t exist for him. He isn’t a physical being, but more of a sprite, of sorts. Many of them live in the forests in Ireland, and sometimes they get attached to humans. Finn is attached to me, but he’s being very stubborn and staying away from me. You see, my family was quite ostracized in our village for our propensity to attract the sidhe, among other things. The church in Ireland doesn’t much care for that kind of thing, so Ma and Da moved us all here to lead more regular lives. So if I called to Finn while I was feverish, that’s who it was.” It all sounded so ludicrous, but it was the truth. If I had wanted to scare Mr. Fuerst away, certainly I had now accomplished my goal. I looked up to his face with caution. It was unreadable. “Interesting perspective,” he said more to himself. He looked away for a moment. I wondered what he must be thinking of me, perhaps that I’m insane. “You’re in love with Finn, then, correct?” he asked when he turned back around. His eyes searched my face for the answer. There was an odd hope in his eyes, as if he wanted me to affirm my affection for Finn. “No,” I said after a moment, mostly to gauge his reaction. “You aren’t?” he asked, clearly disappointed. This line of questioning had taken a very curious turn. “He was everything to me my entire life, but since moving here, I’ve realized that my mother and father are right. I’ve recently discovered human beings can be quite interesting, too, so Finn no longer holds the allure for me that he once did.” I couldn’t help but sigh a bit. “But I’ll always care about him, and believe he is protecting me.” I stole a look at Mr. Fuerst’s face. His eyes were dark and unreadable. “I’m somewhat non-conventional in my beliefs.” I said this more as a warning than anything else. He took an involuntary step forward and then stopped himself. He stood looking down at me, as if he were deciding his next move. “So am I,” he softly said. Maureen Willett is a writer of fiction that pushes the boundaries of established genres. Her stories mostly come from her own family legends that have been passed down through generations, but then she tops them off with a twist of faery dust and angel wings. But at the core of each story are great characters in very human conflicts that anyone will find compelling. Each novel is crafted as an experience that will take readers beyond their day-to-day lives, incorporating themes of time travel, reincarnation, and magic. She lives in Hawaii and finds its ethereal beauty a source of inspiration for her writing. She is a former journalist, public relations professional, and media marketing specialist. Writing fiction has been her passion since grade school.